Well it is raining here again, which is a bit of a shame as I wanted to go for a walk but true to form the moment I got my boots out it started pouring down. I have sorted out the error that I mentioned yesterday. 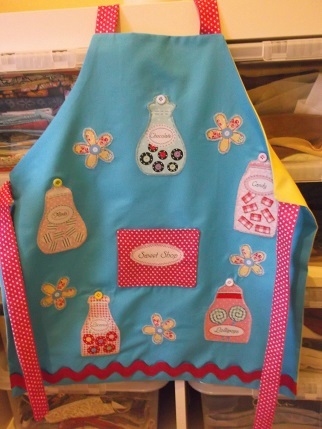 I wanted to make an apron as a birthday gift for a friend’s little girl to send with some baking stuff I have bought. I remember Ellie being bought some baking things at a similar age and loving them so I have got cute pink utensils and pretty cup cake cases. 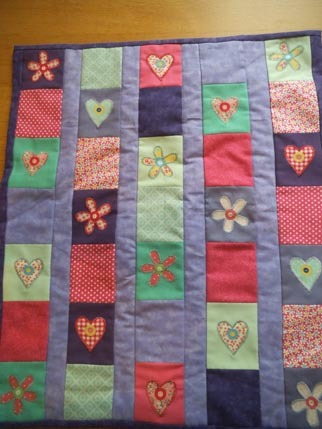 I found a really good free tutorial at a blog called Aesthetic Nest run by a woman called Anneliese who designs beautiful patterns for her 3 daughters (can feel a sewing spree coming on but must, must focus on medieval kit first!) She has an Etsy shop with her patterns and kids’ party printables which look brilliant. She has made reversible ones but I made one out of 2 plain fat quarters from my Simply Solids Club stash and some applique motifs from a really cute fabric called Sweet Treats that I bought I couple of years ago. And I am very pleased with the result. I particularly like the spotty pocket and straps. I stitched the Sweet Shop label onto the pocket and added some buttons onto the sweetie jars. Am planning to add some sweets to the package for cake decorating so hope that she will like it. I used the fabric motifs last year as part of a cot quilt that I made for Ellie’s friend and I still have quite a few motifs left over. Have also finished stitching the replacement for the Autumn exchange piece that went missing so that will go in the post next week – fingers crossed this one gets there ok! Hope you are having a lovely time whatever you are doing and thanks for visiting. Yes, the weather has been most unreliable, hasn’t it! Still – you’ve made good use of it!